and is beginning to be known for Olive Oil. The US is the third largest olive oil producer, with virtually all of it produced in California. Areas that are good for wine are generally also good for olive oil. Olive trees have a long life, and commonly produce for hundreds of years. Olive trees also make excellent carving wood. Most are sold at the location listed. Some may be difficult to obtain. No retailers in the area carry the local Olive Oil as far as I have been able to determine. Made from olives from Livermore, around Eckert Winery. $11 to $15 per 375ml bottle. Darcy Kent Vineyards 7639 Cedar Mountain Drive, Livermore. Available from the winery. Genesis Ranch was established in February 1995 with the planting of 20 acres of Manzanillo olive trees. The orchard and family home are located in the southeast corner of Livermore Valley on Cross Road. Today, the orchard is producing a limited bottling of premium 100% extra virgin gourmet olive oil. The olives are hand picked in November and immediately cold pressed. The oil is then filtered for clarity. 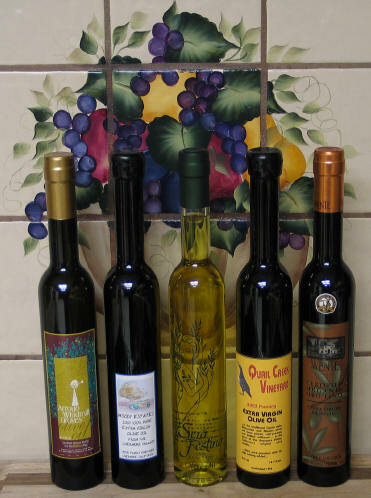 Genesis Ranch Olive Oil is sold privately and through local wineries, and is served at local restaurants. The Genesis Ranch orchard is meticulously managed and cared for by the Miille family. Natives of California, the Miilles are raising their family at Genesis Ranch. Often the whole family can be seen working in the orchard. 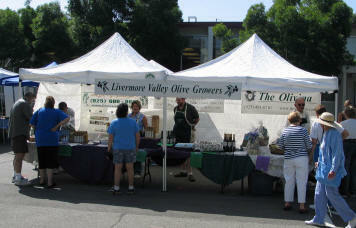 Established in 1881, Olivina was one of the first grape and olive growers in Livermore. Originally the 2000 acres was marked by the stone gateway with "Olivina" in wrought iron. The historic arched gateway still stands today at the corner of Wetmore and Arroyo Roads. In 1940, the Crohare family purchased approximately 700 acres and utilized the land for cattle operation. Olive varieties planted on the property consist of Mission (over 3,000 trees), Arbequina (over 1,500 trees), Lucca (242 trees), Frantoio (about 6,200 trees) and original trees over 100 years old. The California Olive Oil Council has certified the olives harvested in November 2003 as "Gold" for the Arbequina olives and "High Silver" for the Mission olives with a very low fatty acid (0.4%). Oil from Olivina received the California Olive Oil Council seal of quality to note 100% California Extra Virgin Olive Oil that is low in fatty acids and free of defects. All of the olive oil from Olivina is cold pressed unfiltered for the highest quality, flavor and aroma. See additional information and photos here. Manzanillo & Mission olives from trees near the southern end of Greenville Road.. Cold-pressed, and unfiltered. Our 1222 Manzanillo olive trees were planted in May, 1995. This orchard was the first orchard planted as part of the South Livermore plan, an Alameda County land use plan that blends the interest of agriculture and the smart development. This plan requires land subdivision to a minimum of 20 acres with a requirement that 90% be planted in cultivated crop of olives or grapes. These Manzanillo olives have produced multiple crops of 100% extra virgin premium olive oil that is used in local restaurants, sold at many of the 22 local wineries and at The Purple Orchid Inn Resort and Spa. Enjoy this first cold pressed extra virgin olive oil! $19.99 for a 375ml bottle. Contact: Karen Hughs: karen@purpleorchid.com or Heidi Farah. Oro Fino at Wente Vineyards 5565 Tesla Road, Livermore $19.99 for a 375ml bottle. Available at the winery. Estate Grown Certified Organic "Oro Fino" Extra Virgin Olive oil, from a century old grove. Made from Lucque, Manzanillo, Picholine, Ascolano, Mission & Sevillano olives. Wood Family Vineyards 7702 Cedar Mountain Drive, Livermore Hand picked olives, from trees surrounding the vineyard. Rhonda Wood: rhondaroo@hotmail.com or Michael Wood. Olive Oil can be purchased directly from the producers, via the above contact information. 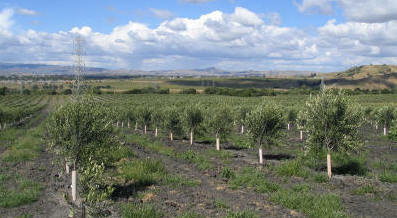 Olive Trees planted in 2001 at Olivina Ranch.